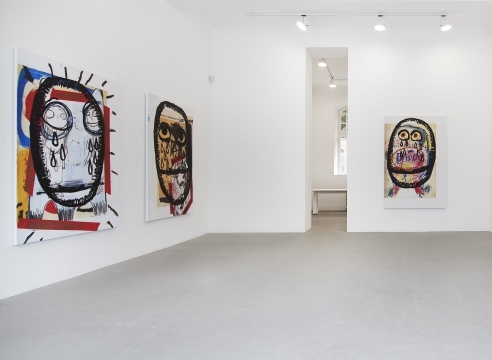 Bjarne Melgaard started out in the mid 1990ʼs with a neo expressionistic, frantic style of painting, sculpture and installation. His art deals with the dark side of humanity, such as self-destruction, deviant sexuality and odd religious beliefs. It provides an insight into subcultures and parallel worlds that exists alongside the world of normality - often discussing, investigating and pushing the boundaries of societal acceptance. Melgaard has an intense way of almost attacking the canvas with paint. A variety of layers in different techniques gives the work a painterly quality that literally sweep the viewer into a myriad of colors, forms and expressions. The brush strokes and splashes of paint form a base for an explicit and perhaps offensive narrative. Organized chaos is one of his main principles both regarding composition and content, focusing on capturing the tension and impromptu of the creative moment. For the exhibition at Market Art Fair Bjarne Melgaard has produced a wallpaper with Snøhetta, depicting himself and his partner in private photos and snapshots from their everyday life. At the same time as it serves as a congenial background to his paintings, it reflects the societal ambiguity to expose both the triviality of life and to stage an image of it’s perfection - making it appear carefree and pretty. His exhibition at Market Art Fair is in direct dialogue with the upcoming show Dagen Etter, that Bjarne Melgaard has co-curated with curator/publisher Elise By Olsen, for Anna Bohman Gallery in Stockholm. Together the two exhibitions illustrate the contradictions and obscurities in the notion of humanity. Bjarne Melgaard was born 1967 in Sydney, Australia. He attended the Academy of Fine Arts in Warsaw (1990) and the Norwegian National Academy of Fine Arts (1991), before he moved on to The Netherlands to complete his studies at Rijksakademie in Amsterdam and afterwards the Jan van Eyck Academie in Maastricht (1993). Since then Melgaard has lived and worked in Poznań, Warsaw, Maastricht, Antwerpen, Amsterdam, Sydney, Brussels, Copenhagen, Berlin, Barcelona and New York before moving back to Oslo in 2017. In 2011, Melgaard was given a mid-career retrospective at the Astrup Fearnley Museum in Oslo. He has twice participated in the Biennale de Lyon and in 2014, he participated in The Whitney Biennial. In January 2015 Melgaard was the focus of the first of six important exhibitions at the Munch Museum in Oslo, MELGAARD + MUNCH The end of it all has already happened. Bjarne Melgaard’s work is represented in a number of leading museums and international art collections, such as: The Museum of Modern Art, New York; The Museum of Contemporary Art (MOCA), Los Angeles; Saatchi Gallery Collection, London; Stedelijk Museum, Amsterdam; Moderna Museet, Stockholm; Astrup Fearnley Museum of Modern Art, Oslo.